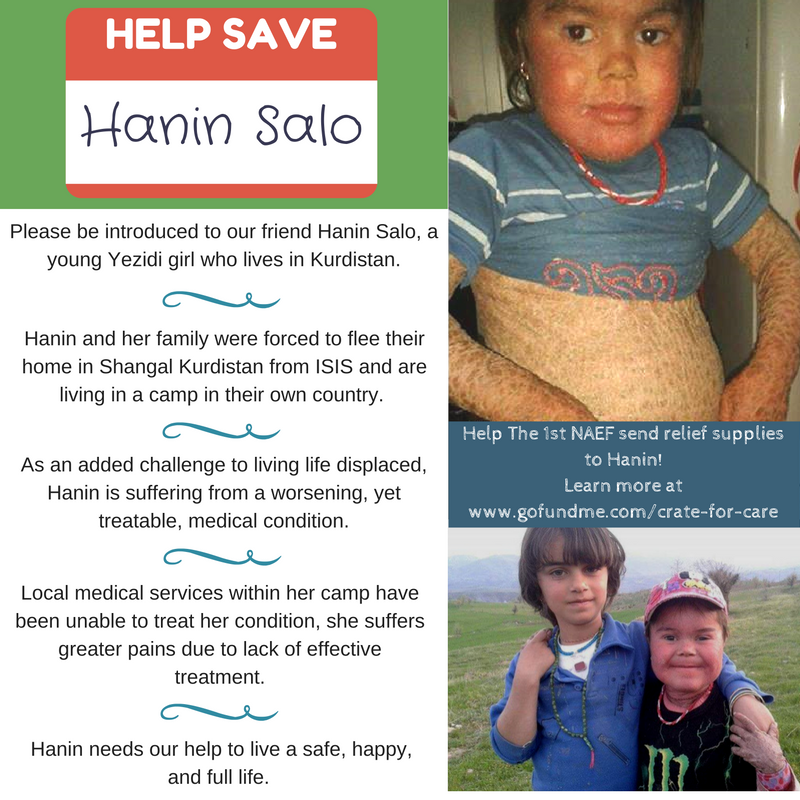 In October 2015 the plight of an eight-year-old ethnic Yezidi girl named Hanin Salo was brought to the attention of The 1st NAEF. Hanin is suffering from a worsening hereditary medical condition while she and her family are living in a Refugee Camp after being forced to flee their home in Shangal. Local medical services have been unable to treat her condition(s). Furthermore, the mysterious nature of her illness has caused her and her family to be shunned by their fellow refugees. While all in the camp are suffering deprivation, Hanin’s case stands out. We at the 1st NAEF have been working to gather what resources and influence we can to assist this innocent girl and her family. We have appealed to the Canadian Government for assistance to #HelpSaveHaninSalo and hope that Canada's recent decision to provide direct Yezidi aid will see Hanin helped. The 1st NAEF asks for you to actively support our efforts, which will directly and profoundly benefit this young girl's future. Canadians: Please help us by sending an email to the Right Honourable Justin Trudeau, P.C., M.P., Prime Minister of Canada as per the template below. For all 1st NAEF followers: We humbly request that you kindly provide a donate to support our continued Yezidi focused aid programs. Offers of out-of-country care for Hanin can be made to: admin@1naef.com with the subject line of - Help Save Hanin Salo. Together we can Save Hanin Salo. Thank you. Text: I __________, as a citizen of Canada support The 1st NAEF in their efforts to rescue Hanin Salo.